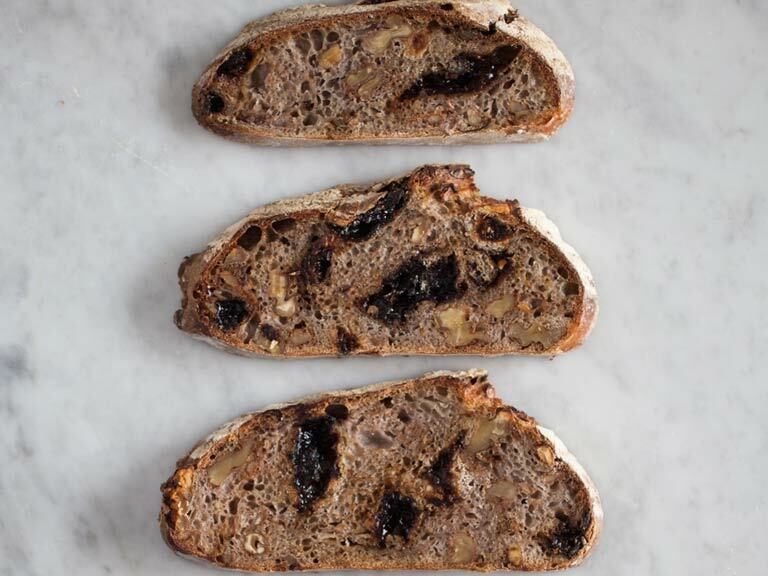 A sourdough loaf enriched with walnuts, prunes, honey and spices, extracted from Chris Young's recipe book Slough Dough. This loaf is the creation of “Magic” Dragan, the Conjuring Croatian. He says, “The smell of the loaves baking is enough to lift the spirits on even the dullest day!”, and that blend of honey, fruit, nuts and spices is guaranteed to lift your spirits. It goes well with cheese and I’m assured it makes outstanding toast for breakfast, if there’s any left by then. 1. Mix the flour, sourdough starter, water, honey and yeast together thoroughly. Cover and leave at room temperature for 1 hour. 2. Stretch the dough out, scatter the salt over it and then knead until you have a smooth, stretchy dough. Cover the dough and leave to relax for 10 minutes. 3. Crush the seeds from the cardamom pods in a mortar and pestle, discarding the husks. Flatten out the dough and spread evenly with the prunes, walnuts, cumin and cardamom. Knead until all the ingredients are incorporated and evenly distributed, then shape the dough into a ball. Cover and leave for 30 minutes before giving the dough a single fold. 4. Leave for a further 30 minutes before giving the dough another single fold, then cover and leave to rise for a further 2 hours. 5. Divide the dough into 2 equal-size pieces, shape into balls, cover and leave to rest for 15 minutes. 6. Dust two 500g/1lb proving baskets with flour. Shape the dough balls to fit and place them seam-side up in the baskets. Cover and leave to rise at room temperature for 1 hour. 7. Heat the oven to 230C/210C fan/450F/gas 8, with a large baking stone or baking sheet in place. Turn the loaves out onto a floured peel. Slash the top of each loaf, slide them gently onto the baking stone and bake for 35 minutes.